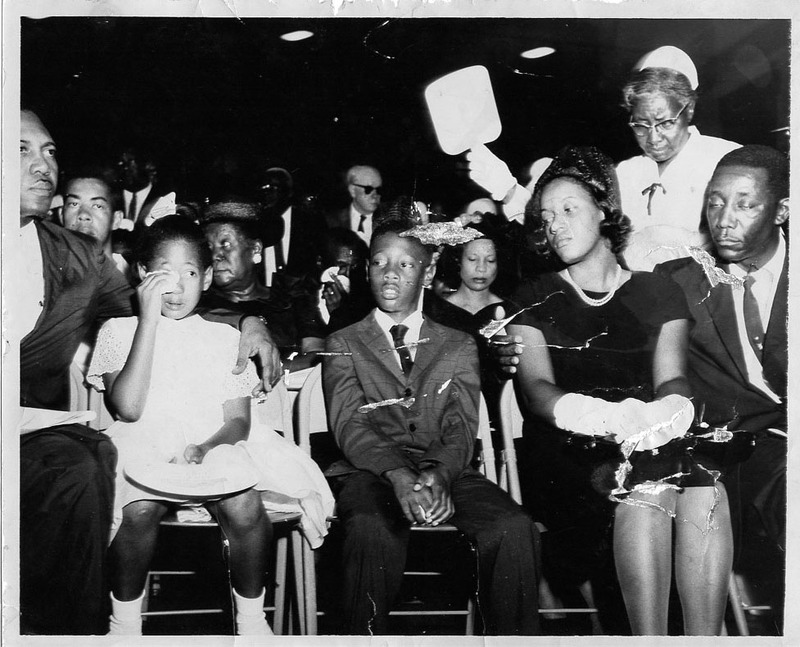 This black and white photo was taken at Medgar Evers' funeral held on June 15, 1963 at the Jackson, Mississippi Masonic Temple three days after Evers was shot and killed outside his Jackson home. Pictured are Evers' children Reena and Darrel; Evers' widow, Myrlie Beasley Evers; and Evers' brother Charles Evers. Over 4,000 people attended the funeral including Roy Wilkins, National Association for the Advancement of Colored People, and Dr. Martin Luther King, Jr., Southern Christian Leadership Conference. Evers had been an important leader in the Mississippi Freedom Movement working to integrate the University of Mississippi; as a field secretary in Mississippi for the NAACP; and as an organizer of the lunch counter sit-ins with Tougaloo college students.